Breakfast truly is the most important meal of the day. Start your morning off right with this deliciously healthy Bell Pepper and Goat Cheese Frittata Recipe. Each serving is just 3 Points making it an ideal low calorie breakfast recipe to help get you off on the right foot. Pair it with some 0 Points fruit and/or a slice of high fiber, whole grain bread, and you’ve got yourself one tasty way to start a morning! Though frittata sounds like such a fancy word, it’s really just a baked omelet. Which is made even more fabulous by the fact that you don’t have to deal with flipping it (I am AWFUL at flipping omelets). Each frittata recipe serving is very nicely sized and all the protein makes it super satisfying. This quick and healthy breakfast idea is a must try! 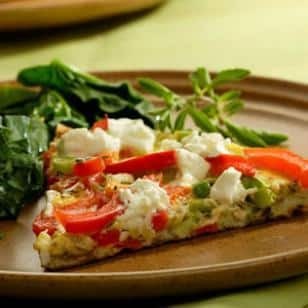 Indulge in a gourmet breakfast with this healthy, low calorie Bell Pepper and Goat Cheese Frittata Recipe. Each serving is just 3 Points making it a delicious way to start your day and leaving a lot of Points in your bank! In a medium sized bowl whisk together the egg substitute, garlic, basil, salt and pepper. Spray a large, ovenproof, nonstick skillet with nonfat cooking spray and set over medium heat. Add in bell pepper and green onions and cook, stirring constantly, until the green onions are just wilted, 30 seconds to 1 minute. Pour the egg mixture over the vegetables and cook, lifting the edges of the frittata to allow the uncooked egg to flow underneath, until the bottom is light golden, 2 to 3 minutes. Dot the top of the frittata with cheese, transfer the pan to the oven and broil until puffy and lightly golden on top, 2 to 3 minutes. Let rest for about 3 minutes before serving. I made this this morning for breakfast and it was so delicious!! Loved it! I did add a lil cayenne pepper and red pepper flakes b/c u like a lil spice but other than that followed the recipe to a T. Super easy and yummy! Will definitely make again! Great site. Came upon it by accident but plan to keep it in my favorites! This sounds wonderful!!!! question though,,,,do you put the goat cheese in before or after it goes in the oven? Thanks! Smyoker, my bad. I forgot to include that part in my post. The cheese goes on right before it goes into the oven. I’ve updated the post to include this in the instructions. include this in the instructions.